in the village which belongs to us. They could not just say “corpse” but would elaborate: “which lies on its back on clods of earth.” Instead of “don’t be afraid,” they would say, “Bring your heart back down out of your mouth, your heart out of your mouth, get it back down from there.” The drums generated fountains of oratory. This seemed inefficient. Was it grandiloquence or bombast? Or something else? For a long time Europeans in sub-Saharan Africa had no idea. In fact they had no idea that the drums conveyed information at all. 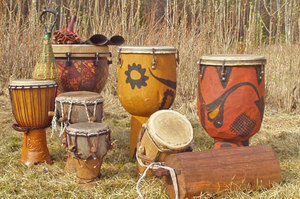 In their own cultures, in special cases a drum could be an instrument of signaling, along with the bugle and the bell, used to transmit a small set of messages: attack; retreat; come to church. But they could not conceive of talking drums. In 1730 Francis Moore sailed eastward up the Gambia River, finding it navigable for six hundred miles, all the way admiring the beauty of the country and such curious wonders as “oysters that grew upon trees” (mangroves). He was not much of a naturalist. He was reconnoitering as an agent for English slavers in kingdoms inhabited, as he saw it, by different races of people of black or tawny colors, “as Mundingoes, Jolloiffs, Pholeys, Floops, and Portuguese.” When he came upon men and women carrying drums, carved wood as much as a yard long, tapered from top to bottom, he noted that women danced briskly to their music, and sometimes that the drums were “beat on the approach of an enemy,” and finally, “on some very extraordinary occasions,” that the drums summoned help from neighboring towns. But that was all he noticed. Suddenly he became totally abstracted, and remained for a while in the attitude of listening. On being taxed with inattention, he said, “You no hear my son speak?” As we had heard no voice, he was asked how he knew it. He said, “Drum speak me, tell me come up deck.” This seemed to be very singular. The captain’s skepticism gave way to amazement, as Glasgow convinced him that every village had this “facility of musical correspondence.” Hard though it was to believe, the captain finally accepted that detailed messages of many sentences could be conveyed across miles. “We are often surprised,” he wrote, “to find the sound of the trumpet so well understood in our military evolutions; but how far short that falls of the result arrived at by those untutored savages.” That result was a technology much sought in Europe: long-distance communication faster than any traveler on foot or horseback. Through the still night air over a river, the thump of the drum could carry six or seven miles. Relayed from village to village, messages could rumble a hundred miles or more in a matter of an hour. Batoko fala fala, tokema bolo bolo, boseka woliana imaki tonkilingonda, ale nda bobila wa fole fole, asokoka l’isika koke koke. The mats are rolled up, we feel strong, a woman came from the forest, she is in the open village, that is enough for this time. La nkesa laa mpombolo, tofolange benteke biesala, tolanga bonteke bolokolo bole nda elinga l’enjale baenga, basaki l’okala bopele pele. Bojende bosalaki lifeta Bolenge wa kala kala, tekendake tonkilingonda, tekendake beningo la nkaka elinga l’enjale. Tolanga bonteke bolokolo bole nda elinga l’enjale, la nkesa la mpombolo. In the morning at dawn, we do not want gatherings for work, we want a meeting of play on the river. Men who live in Bolenge, do not go to the forest, do not go fishing. We want a meeting of play on the river, in the morning at dawn. Clarke noted several facts. While only some people learned to communicate by drum, almost anyone could understand the messages in the drumbeats. Some people drummed rapidly and some slowly. Set phrases would recur again and again, virtually unchanged, yet different drummers would send the same message with different wording. Clarke decided that the drum language was at once formulaic and fluid. “The signals represent the tones of the syllables of conventional phrases of a traditional and highly poetic character,” he concluded, and this was correct, but he could not take the last step toward understanding why. These Europeans spoke of “the native mind” and described Africans as “primitive” and “animistic” and nonetheless came to see that they had achieved an ancient dream of every human culture. Here was a messaging system that outpaced the best couriers, the fastest horses on good roads with way stations and relays. Earth-bound, foot-based messaging systems always disappointed. Their armies outran them. Julius Caesar, for example, was “very often arriving before the messengers sent to announce his coming,” as Suetonius reported in the first century. The ancients were not without resources, however. The Greeks used fire beacons at the time of the Trojan War, in the twelfth century BCE, by all accounts—that is, those of Homer, Virgil, and Aeschylus. A bonfire on a mountaintop could be seen from watchtowers twenty miles distant, or in special cases even farther. In the Aeschylus version, Clytemnestra gets the news of the fall of Troy that very night, four hundred miles away in Mycenae. “Yet who so swift could speed the message here?” the skeptical Chorus asks. She credits Hephaestus, god of fire: “Sent forth his sign; and on, and ever on, beacon to beacon sped the courier-flame.” This is no small accomplishment, and the listener needs convincing, so Aeschylus has Clytemnestra continue for several minutes with every detail of the route: the blazing signal rose from Mount Ida, carried across the northern Aegean Sea to the island of Lemnos; from there to Mount Athos in Macedonia; then southward across plains and lakes to Macistus; Messapius, where the watcher “saw the far flame gleam on Euripus’ tide, and from the highpiled heap of withered furze lit the new sign and bade the message on”; Cithaeron; Aegiplanetus; and her own town’s mountain watch, Arachne. “So sped from stage to stage, fulfilled in turn, flame after flame,” she boasts, “along the course ordained.” A German historian, Richard Hennig, traced and measured the route in 1908 and confirmed the feasibility of this chain of bonfires. The meaning of the message had, of course, to be pre arranged, effectively condensed into a single bit. A binary choice, something or nothing: the fire signal meant something, which, just this once, meant “Troy has fallen.” To transmit this one bit required immense planning, labor, watchfulness, and firewood. Many years later, lanterns in Old North Church likewise sent Paul Revere a single precious bit, which he carried onward, one binary choice: by land or by sea. More capacity was required, for less extraordinary occasions. People tried flags, horns, intermitting smoke, and flashing mirrors. They conjured spirits and angels for purposes of communication—angels being divine messengers, by definition. The discovery of magnetism held particular promise. In a world already suffused with magic, magnets embodied occult powers. The lodestone attracts iron. This power of attraction extends invisibly through the air. Nor is it interrupted by water or even solid bodies. A lodestone held on one side of a wall can move a piece of iron on the other side. Most intriguing, the magnetic power appears able to coordinate objects vast distances apart, across the whole earth: namely, compass needles. What if one needle could control another? This idea spread—a “conceit,” Thomas Browne wrote in the 1640s, whispered throughout the world with some attention, credulous and vulgar auditors readily believing it, and more judicious and distinctive heads, not altogether rejecting it. The conceit is excellent, and if the effect would follow, somewhat divine; whereby we might communicate like spirits, and confer on earth with Menippus in the Moon. I told him that I would gladly buy, but wanted to see by experiment and that it would be enough for me if he would stand in one room and I in another. He replied that its operation could not be detected at such a short distance. I sent him on his way, with the remark that I was not in the mood at that time to go to Cairo or Moscow for the experiment, but that if he wanted to go I would stay in Venice and take care of the other end. The idea was that if a pair of needles were magnetized together—“touched with the same Loadstone,” as Browne put it—they would remain in sympathy from then on, even when separated by distance. One might call this “entanglement.” A sender and a recipient would take the needles and agree on a time to communicate. They would place their needle in disks with the letters of the alphabet spaced around the rim. The sender would spell out a message by turning the needle. “For then, saith tradition,” Browne explained, “at what distance of place soever, when one needle shall be removed unto any letter, the other by a wonderful sympathy will move unto the same.” Unlike most people who considered the idea of sympathetic needles, however, Browne actually tried the experiment. It did not work. When he turned one needle, the other stood still. Browne did not go so far as to rule out the possibility that this mysterious force could someday be used for communication, but he added one more caveat. Even if magnetic communication at a distance was possible, he suggested, a problem might arise when sender and receiver tried to synchronize their actions. How would they know the time, it being no ordinary or Almanack business, but a probleme Mathematical, to finde out the difference of hours in different places; nor do the wisest exactly satisfy themselves in all. For the hours of several places anticipate each other, according to their Longitudes; which are not exactly discovered of every place. This was a prescient thought, and entirely theoretical, a product of new seventeenth-century knowledge of astronomy and geography. It was the first crack in the hitherto solid assumption of simultaneity. Anyway, as Browne noted, experts differed. Two more centuries would pass before anyone could actually travel fast enough, or communicate fast enough, to experience local time differences. For now, in fact, no one in the world could communicate as much, as fast, as far as unlettered Africans with their drums. By the time Captain Allen discovered the talking drums in 1841, Samuel F. B. Morse was struggling with his own percussive code, the electromagnetic drumbeat designed to pulse along the telegraph wire. Inventing a code was a complex and delicate problem. He did not even think in terms of a code, at first, but “a system of signs for letters, to be indicated and marked by a quick succession of strokes or shocks of the galvanic current.” The annals of invention offered scarcely any precedent. How to convert information from one form, the everyday language, into another form suitable for transmission by wire taxed his ingenuity more than any mechanical problem of the telegraph. It is fitting that history attached Morse’s name to his code, more than to his device. The dictionary or vocabulary consists of words alphabetically arranged and regularly numbered, beginning with the letters of the alphabet, so that each word in the language has its telegraphic number, and is designated at pleasure, through the signs of numerals. Seeking efficiency, he weighed the costs and possibilities across several intersecting planes. There was the cost of transmission itself: the wires would be expensive and would convey only so many pulses per minute. Numbers would be relatively easy to transmit. But then there was the extra cost in time and difficulty for the telegraphists. The idea of code books—lookup tables—still had possibilities, and it echoed into the future, arising again in other technologies. Eventually it worked for Chinese telegraphy. But Morse realized that it would be hopelessly cumbersome for operators to page through a dictionary for every word. The clerks who attend at the recording instrument become so expert in their curious hieroglyphics, that they do not need to look at the printed record to know what the message under reception is; the recording instrument has for them an intelligible articulate language. They understand its speech. They can close their eyes and listen to the strange clicking that is going on close to their ear whilst the printing is in progress, and at once say what it all means. In the name of speed, Morse and Vail had realized that they could save strokes by reserving the shorter sequences of dots and dashes for the most common letters. But which letters would be used most often? Little was known about the alphabet’s statistics. In search of data on the letters’ relative frequencies, Vail was inspired to visit the local newspaper office in Morristown, New Jersey, and look over the type cases. He found a stock of twelve thousand E’s, nine thousand T’s, and only two hundred Z’s. He and Morse rearranged the alphabet accordingly. They had originally used dash-dash-dot to represent T, the second most common letter; now they promoted T to a single dash, thus saving telegraph operators uncountable billions of key taps in the world to come. Long afterward, information theorists calculated that they had come within 15 percent of an optimal arrangement for telegraphing English text. 1. The trip was sponsored by the Society for the Extinction of the Slave Trade and the Civilization of Africa for the purpose of interfering with slavers. 3. Operators soon distinguished spaces of different lengths—intercharacter and interword—so Morse code actually employed four signs.